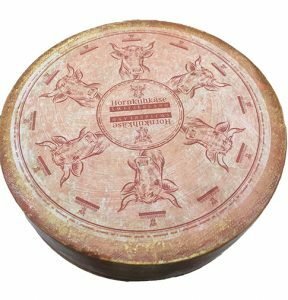 New to Stock: Hornkuhkäse - Zuercher & Co.
Made in a small town in Switzerland just west of Liechtenstein, Hornkuhkäse is no ordinary alpine cheese. The milk used is that of horned cows. In the town of Urnäsch, where the cheese is made, virtually all cows still have their horns, as opposed to the 20% in Swiss agriculture. The symbiotic relationship between animal and farmer is fundamental there, and the cheese reflects it. Hornkuhkäse has the flavors of a true alpine; nutty, brothy, with a nice sharp hint of onion. The texture is velvety smooth, and pleasantly melts in your mouth. In 2016 Hornkuhkäse placed first runner up in the World Championship Cheese Contest.